Maidstone United were left to rue their missed chances as they were held to a draw by struggling Solihull Moors at the Gallagher Stadium. The Stones couldn’t have wished for a better start as with just 42 seconds on the clock, they took the lead. A long ball over the top was deflected into the path of Joe Pigott who held his nerve to lob Nick Townsend in the Moors goal. Solihull then had a series of corners but they couldn’t work Lee Worgan from any of these and on 21 minutes, the Stones should have doubled their advantage. Good work from Jamar Loza put Johan ter Horst in and he rounded Townsend but ter Horst went for a high finish and he accidentally sent the ball onto the bar. The Moors were struggling at the back at times and another defensive mistake gifted Maidstone another opportunity. From this, Pigott managed to find ter Horst but it was a difficult chance for the striker and his effort rebounded off Townsend before being cleared. Then on 28 minutes, Maidstone thought they had scored again. Joe Anderson put a delightful ball forward for Pigott who volleyed in but the Stones’ striker was adjudged to have been in an offside position. The Stones initially struggled to get going again after the break and the visitors sensed they could get an equaliser. Darren Carter’s shot from distance was only parried by Worgan and the arriving Kwane Thomas fired the rebound over the bar when well placed. And not long after this, Solihull were given a throw out on the left. The ball was sent into the box and it dropped to Shepherd Murombedzi whose low shot looked certain to go in but he was denied by a good save from Worgan. It wasn’t long before Maidstone began to up the tempo once more though. Substitute Magnus Okuonghae played the ball into Stuart Lewis who battled to make room for an attempt on goal which Townsend did well to block with his leg. Pigott then went close with a free-kick from the edge of the box and a good spell of possession from Maidstone ended with Loza firing just over but Solihull did equalise with 64 minutes gone. Substitute Akwasi Asante got in down the left and although Worgan did well to parry his effort, he could do nothing to stop Thomas from scoring from close range from the rebound. The Moors’ lead could have lasted just two minutes. Ter Horst squared the ball from the right to Pigott who was in a central position and only had Townsend to beat but unfortunately he shot straight at the Solihull keeper. 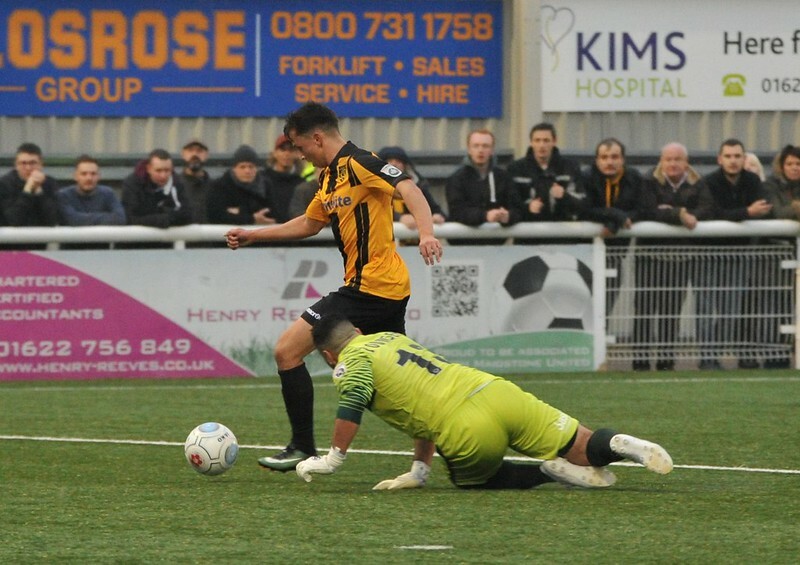 Jay Saunders sent on Zavon Hines for ter Horst as Maidstone searched for a winner and Hines nearly had an immediate impact. The Stones broke quickly as Reason found Hines who cut inside and drove the ball wide of the right post. But at the other end, Solihull were to go even closer. Courtney Richards’ corner dropped to Shepherd Murombedzi and his shot looked to be creeping inside the post until Lewis got it away from the line. Seconds after this, Maidstone put the Moors under pressure. Lewis managed to burst into space and he crossed for the unmarked Joe Anderson who headed the ball over the bar. But this was to be the last time either side threatened as the game ended in a draw. Maidstone United: 1. Lee Worgan, 16. Seth Nana Twumasi, 3. Alex Finney, 5. Alex Wynter (6. Magnus Okuonghae 51), 13. Joe Anderson, 4. Reece Prestedge, 8. Stuart Lewis, 14. Jai Reason, 7. Jamar Loza, 32. Joe Pigott, 22. Johan ter Horst (27. Zavon Hines 71). Subs not used: 2. Josh Hare, 15. Andy McCorkell, 21. Harry Phipps. Solihull Moors: 13. Nick Townsend, 2. Kristian Green, 26. Liam Daly, 30. Fiacre Kelleher, 3. James Bowen, 25. George Carline, 4. Darren Carter, 35. Courtney Richards, 7. Shepherd Murombedzi, 17. Oladapo Afolayan (34. Akwasi Asante 60), 37. Kwane Thomas. Subs not used: 5. Joel Kettie, 8. Ashley Sammons, 10. Jermaine Hylton, 22. Paul Green. Who was your man of the match against Solihull Moors?